If you haven't been to Ed's Easy Diner you are seriously missing out, the amazing diner feel which you receive all across America is now the UK in the form of Ed's Easy Diner. 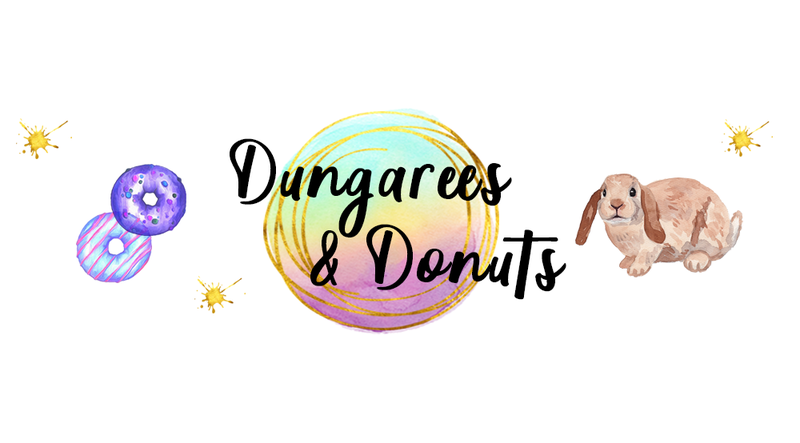 If you haven't heard of them before I shall explain a little more about them and what they have to offer. 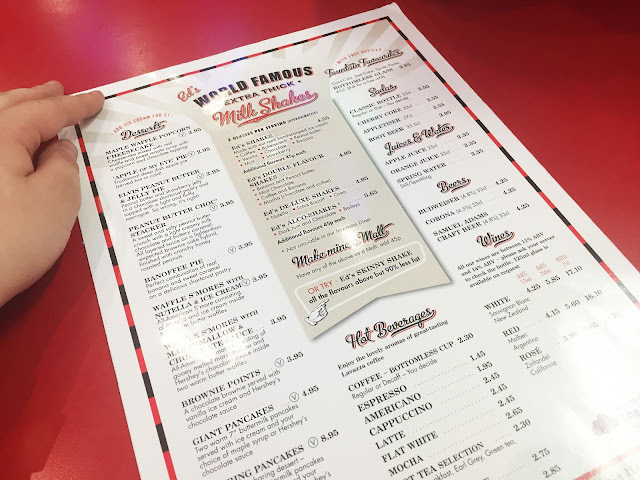 Replicating a 1950's diner in the comfort of cities around the country, with the booths, Jukeboxes filled to the brim with songs from the 50's including Elvis. 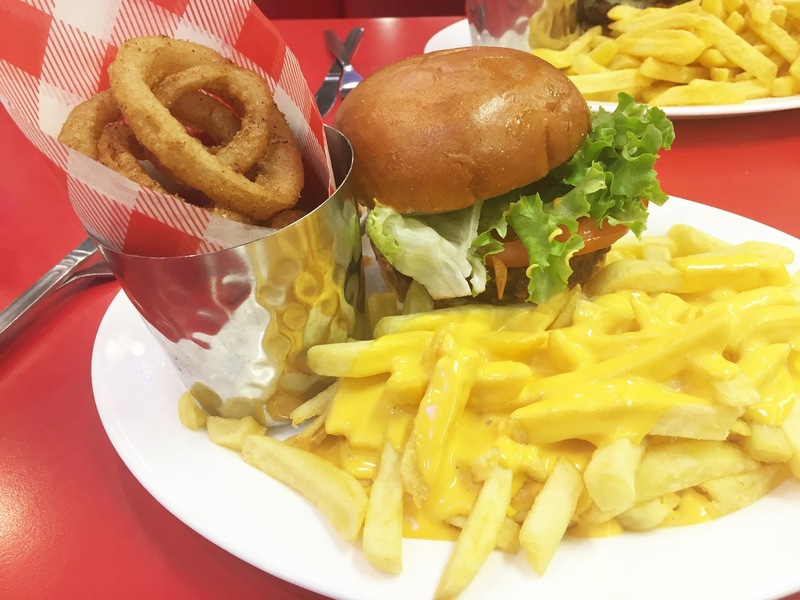 The diner also offers a range of classics such as burgers, fries and hotdogs along with some newer additions to the menu such as cheese fries. 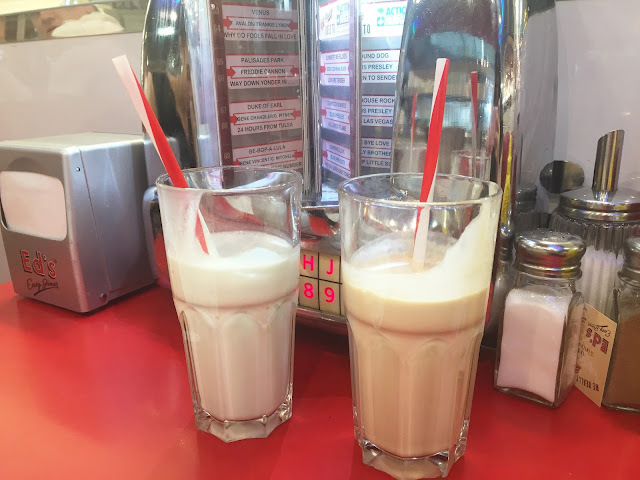 Ed's are well known for their gorgeous extra thick milkshakes as well as their yummy pancakes. I love Ed's and have visited many times for a range of different meals from dessert to breakfast and have left satisfied everytime. 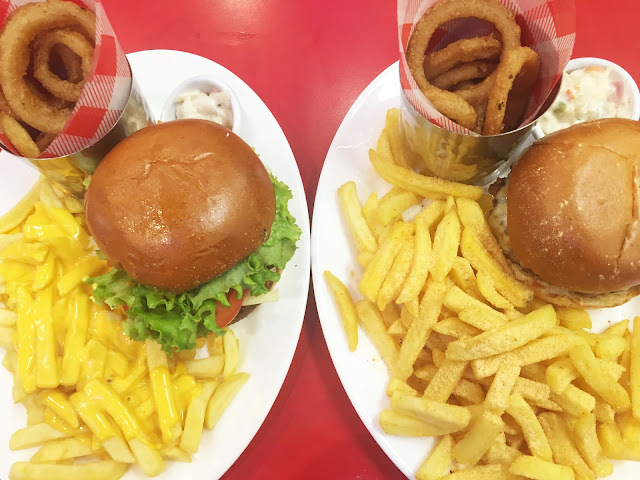 I was recently offered the chance to review Ed's Easy Diner in Grand Central Birmingham to highlight the amazing 15 minute food offerings the city has to offer. Although I sat in Ed's and was there for a while I saw the timer on the speed of the food and it was super impressive in the time which it goes from being prepped being in front of you. 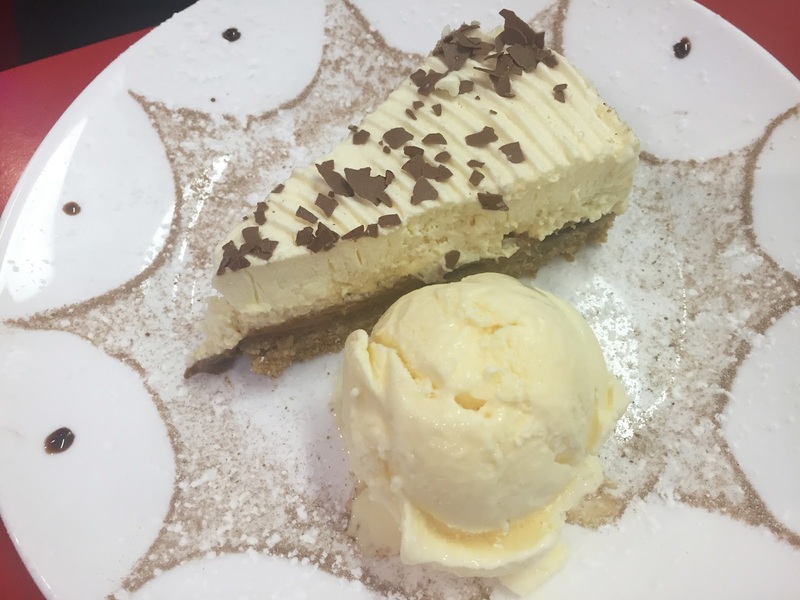 I thought you lot may enjoy my experience in Ed's along with some super yummy pics, yay! When Me and Luke arrived we were greeted by the lovely GM Comrie who was actually our server during our time at Ed's. When we were taken to our booth Comrie pointed us in the direct of the Ed's shakes and told us they were out of this world and totally worth trying! As someone who has already tried them I can totally agree with this and have tried many flavours. I went for a Mint Choc Chip shake and Luke had a Biscoff one. Whilst our milkshakes were being made we were having a browse of the menu, I knew straight away that I wanted a chickpea and quinoa burger and Luke was undecided until Comrie came over and told him about the current promotion with Tabasco, and Luke is the type of person who loves anything spicy so went for the Smoky Joes burger. We both had them as plates which come with fries, onion rings and coleslaw (my fave). When we were ordering we were both asked if we wanted to upgrade our fries and of course I went for cheesy fries and Luke went for the limited edition Buffalo fries. Shortly after we had ordered our gorgeous shakes were brought out and I have to say the mint choc chip is my favourite out of all of the ones I've tried, I think it was because it was refreshing as opposed to sickly. 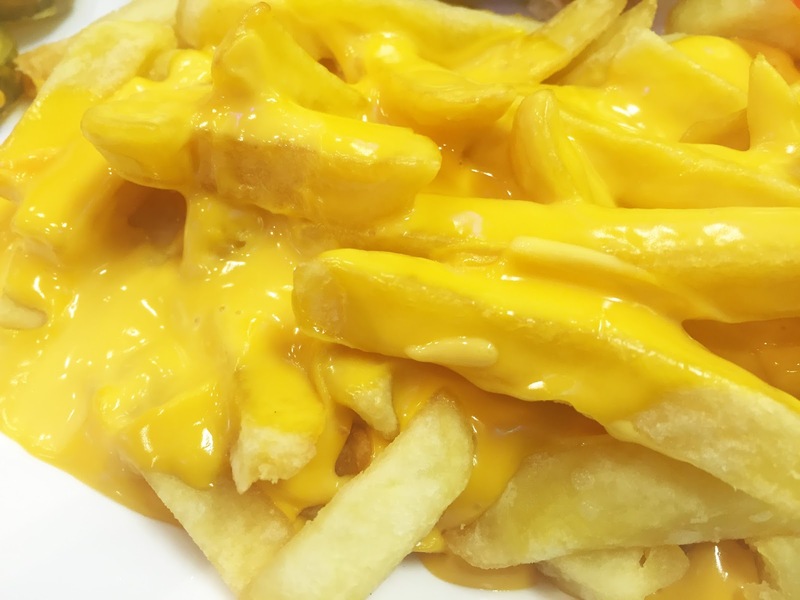 Within 10 minutes our mains were brought out, and I immediately noticed the yummy cheese which was dripping off my fries and I was in love. The portion sizes are HUGE and I was full half way through my fries so Luke had to finish them off for me (which of course he had no problem with, although I did his coleslaw in an exchange because he doesn't like it!) The food itself is amazing and the quick turn around is even better. The restaurant in Grand Central is in the middle of the shopping bit with some other restaurants and it is a little strange that people are walking right by where you are eating but it doesn't take away from the Ed's experience. 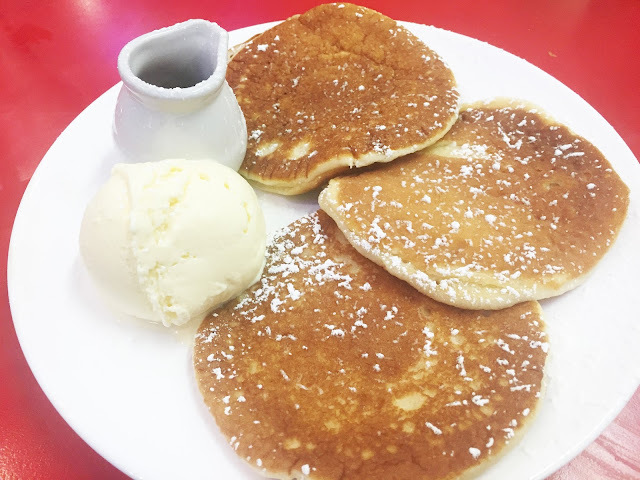 When we had our mains taken away we were offered dessert and as I know how fabulous Ed's pancakes are I had to have some. I was later informed that the pancakes weren't available as they were having problems with the supplier, but Comrie said they can make some of the smaller ones they have so I decided to go for that. Luke went for the Banofee pie. There was a little wait for the dessert but I assume that was because the restaurant picked up. Both deserts were insane and I couldn't even finish mine, but again Luke helped with that. I had an amazing time at Ed's Easy Diner and will continue to go back and try some more of the delicious food. Oh my goodness, that food all looks amazing! I've still not tried an Ed's Easy Diner - I must make it my mission to go next time. I love Ed's so damn much! The best thing is of course the milkshakes. ^_^ Me and my boyfriend haven't been for quite a while now, and as we always get emails with offers I think it might be time for a treat soon. The last time we went they had a great offer on their lunch menu, which we would probably end up doing again.